Pure, bright white at the edges, and pink only in the center. All the flowers that have bloomed since I brought the plant in the apartment are like this. 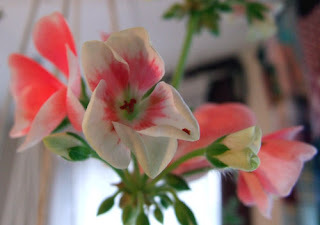 So, when geraniums are denied light, the flowers lose their color. I had no idea this happened. This feels like seventh grade science fair all over again. Now the geranium are in a south facing window, in the sunniest place in the house. Stay tuned for what kind of flowers I get.